Let’s be honest, nearly all of us at some time or another look at celebrity magazines and read the gossip about our famous film, television, sports and pop stars, I suppose this is because a little something inside us tells us we wish we could be like them. Whether you regularly subscribe to a fashion or celebrity magazine, read articles online or whether it is just when in the dentist or doctors waiting room that you read them, we all do it at some time. And of course celebrities in addition to their talent are nearly always considered fashion icons so whatever they wear you can be sure that designers will be looking on with great interest, and of course we as admirers will be watching so we can find outfits for ourselves to mirror theirs, albeit in most cases not in such expensive brands. Whether it be Celebrity Wedding Transport, clothes, shoes, handbags or sunglasses if a celebrity is wearing them others are sure to follow, you only need to look at the huge sums celebrities are paid for advertising products for famous brands such as Nike and famous perfume houses even to the extent of having a perfume named after them to increase sales. Not only do future Bride’s look at the clothes their favourite personalities are wearing on their wedding day but also their hairstyles and how they arrive at their wedding play an important part in what is usually a once in a lifetime occasion. The arrival of the wedding car at the ceremony venue is perhaps the first time the Bride is going to be seen by the many friends, family, well wishers and photographers alike. The many months and sometimes years of planning are surely for this first moment when we all hope for the wow factor from those at the ceremony venue. Of course the proudest of them all on the arrival will be Dad, followed by believe it or not, the dear old wedding car chauffeur who has had the pleasure of driving and reassuring and calming the Bride and delivering Dad and the star of the show to her Premier. Being a wedding car chauffeur or indeed a chauffeur of a celebrity in any wedding car is to be considered a privilege, not only are you in close contact with the person everyone wants to meet but you are privileged to hear or be included in private conversations that happen inside the car. Of course a chauffeur holds a high position of trust and these conversations must never be repeated, they are private and the position a chauffeur holds is one of privilege. So which type of wedding transport are celebrities choosing at present ? There is of course a wide choice out there from the luxury of a traditional modern Rolls-Royce or Bentley, or perhaps a Classic Wedding Car like a Morris Minor or something a little more quirky like a VW Camper Van, all are available and the style and choice is of course down to the individual, so let’s take a look at a few options that celebrities have chosen. Rolls-Royce, Bentley and Aston Martin were the preferred choices for William and Kate’s wedding. Kate Middleton and her father, Michael Middleton, arrived in a 1960’s era Classic Rolls-Royce Phantom VI State Limousine at Westminster Abbey in Central London, while Her Majesty Queen Elizabeth II and her husband HRH Prince Philip, Duke of Edinburgh, made their way to the Abbey in the Royal Bentley State Limousine built specially for Her Majesty, the only one ever produced. 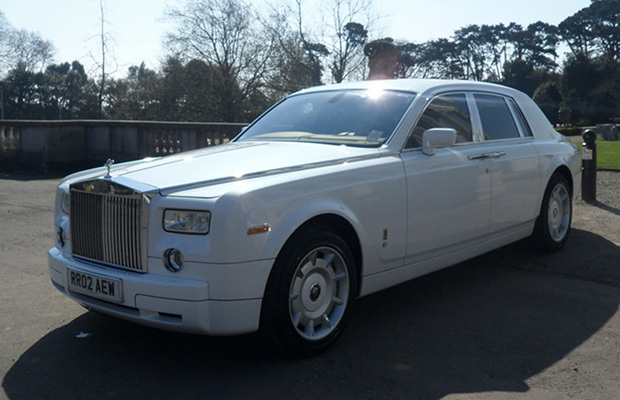 With a Rolls-Royce Ghost as an every day car we could not expect any less of Kim Kardashian’s Wedding Transport. She hired a fleet of White Rolls-Royce Phantom’s for her Celebrity Wedding. Kate Moss used a fleet of 6 Rolls-Royce Silver Shadow’s to transport all 15 Bridesmaids to their Cotswolds Wedding before being whisked away to her Honeymoon in a Helicopter. Michelle Keegan, Coronation Street Star, arrived 30 minutes late at her Wedding with Mark Wright “The Only Way is Essex”, in a Classic Rolls-Royce Phantom VI for a Suffolk based Wedding. Married in 2015 to F1 boss Christian Horner, the former Spice Girl hired a Classic Rolls-Royce Silver Cloud III as her Celebrity Wedding Transport. A wedding is not a time to hold back, and if the Bride wishes to arrive in celebrity style poor old Dad had better start saving early as weddings nowadays will in most cases cost a minimum of £10,000 and upwards. With plenty of Celebrity Couples rumoured to be married next year we can’t wait to see the cars they have selected. Premier Carriage is privileged to have provided wedding vehicles for the Aristocracy and Celebrity weddings, we look forward to 2017 in anticipation of many more couples tying the knot.